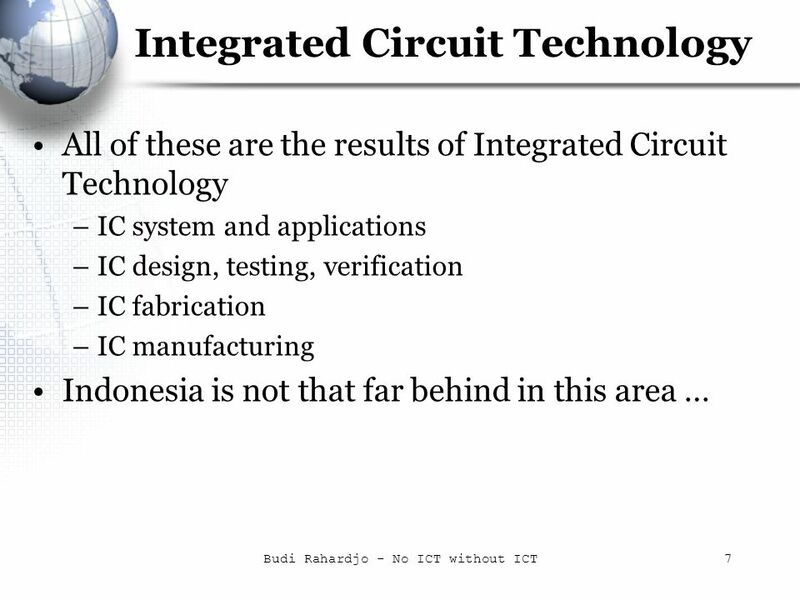 No ICT Without ICT Integrated Circuit Technology (ICT) as the basis for leading edge Information & Communication Technology (ICT) Budi Rahardjo http://budi.insan.co.id. 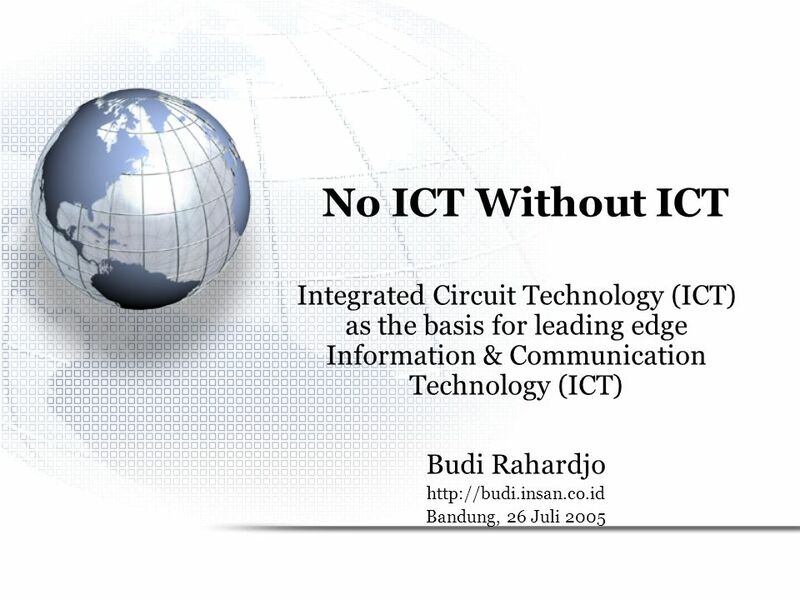 Download ppt "No ICT Without ICT Integrated Circuit Technology (ICT) as the basis for leading edge Information & Communication Technology (ICT) Budi Rahardjo http://budi.insan.co.id." 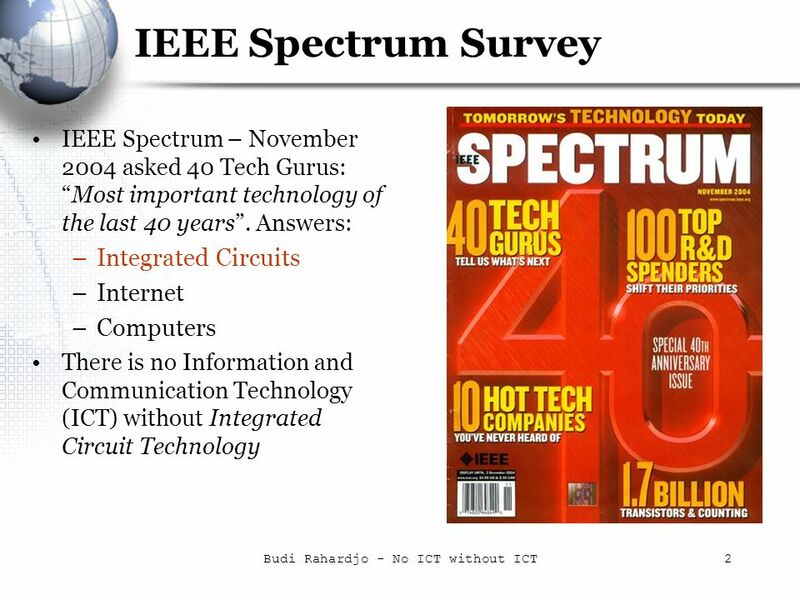 Copyright 2011 Saeed M. Khan as to this presentation. 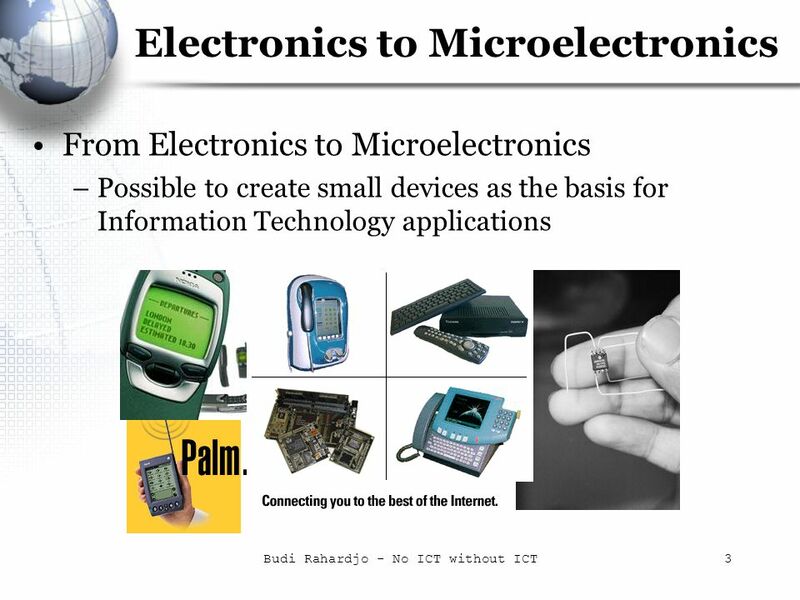 1 Introduction to a Wireless Communication System Dr. Saeed M. Khan. Tobie Barb. 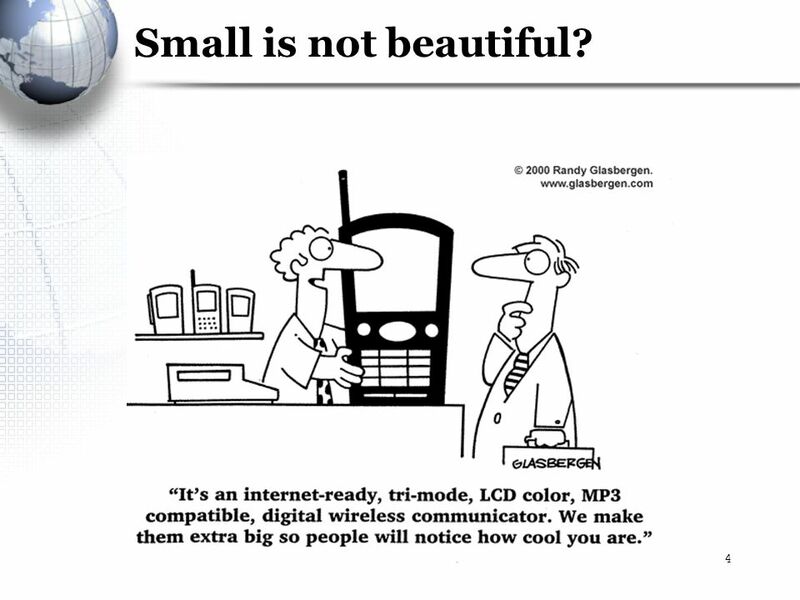 A few important quotes: A hollow strand of glass or plastic no thicker than a human hair Provides a high bandwidth alternative to copper wire. 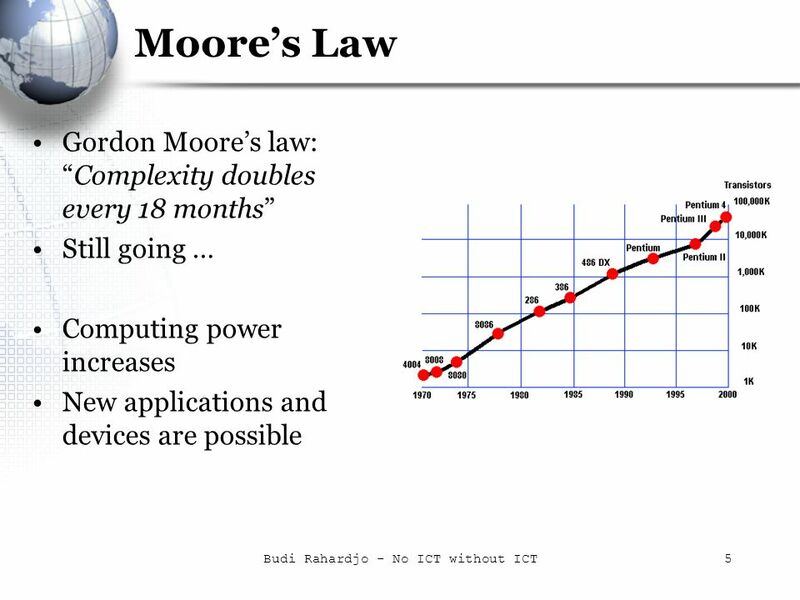 Mobile Computing A new era of mobility Overview Past: History of mobile computing Present: What we have now Future: Whats to come. John Carr Valetta, November, The IGF – a useful compromise WSIS and the Tunis Declaration – 2005 Irresistible force meets immovable object – USA. Whole Systems, Whole Students Eric Brewer UC Berkeley, Google CCC Council November 2, 2012. OPEN SOURCE vs. COMMERCIAL SOFTWARE an academic view Budi Rahardjo Presented at Business Software Alliance. A Bridge Between Engineering and Mathematics Budi Rahardjo Sekolah Teknik Elektro dan Informatika 2007. By Wajeeha and the “Art and Craft” club. 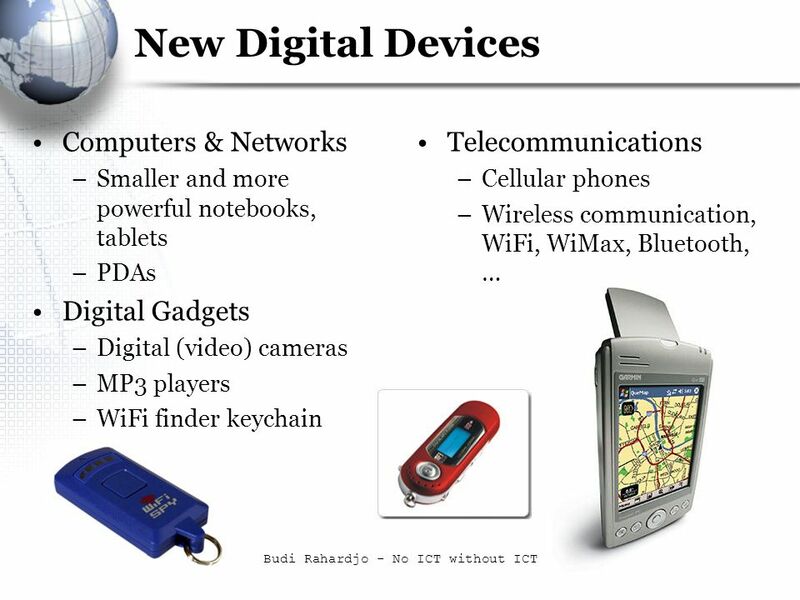 So what do you think is meant by “Latest Portable Devices. Bluetooth and Wi-Fi Kane Hartley. 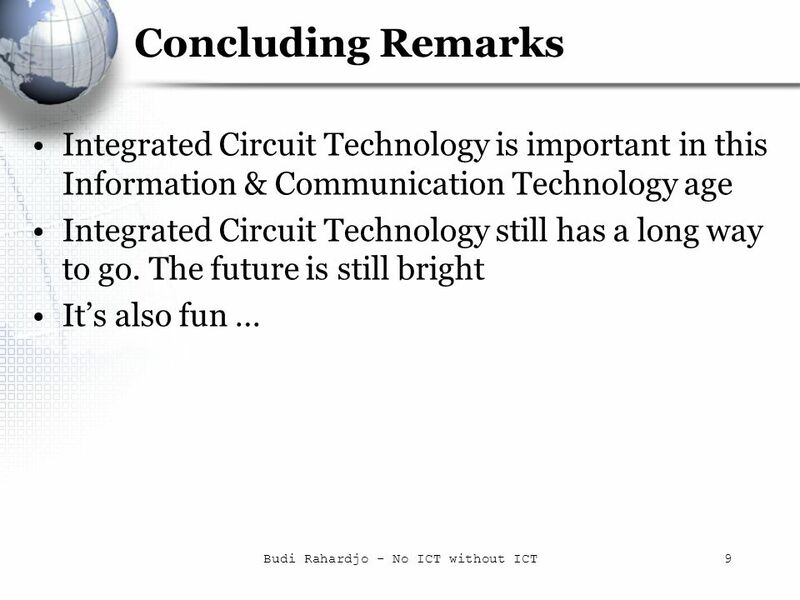 LEIT (ICT7 + ICT8): Cloud strategy - Cloud R&I: Heterogeneous cloud infrastructures, federated cloud networking; cloud innovation platforms; - PCP for. The Role of Academic in Narrowing Digital Divide Budi Rahardjo Director of Research & Development Center on Industry and Information Technology Institut. Recycling Electronic Gadgets for their Rare Earth Metals. I crypt, You crypt Budi Rahardjo Institut Teknologi Bandung – Invited. INFORMATION TECHNOLOGY & TELECOMMUNICATION: ISSUES IN INDONESIA Budi Rahardjo Bana G. Kartasasmita Institut Teknologi Bandung Presented at “New Vision. The Road Ahead Budi Rahardjo Teknik Elektro ITB Bandung Presented – 18 August 2001 before the new ITB EE students 16 March 2002 – Kapita Selekta. 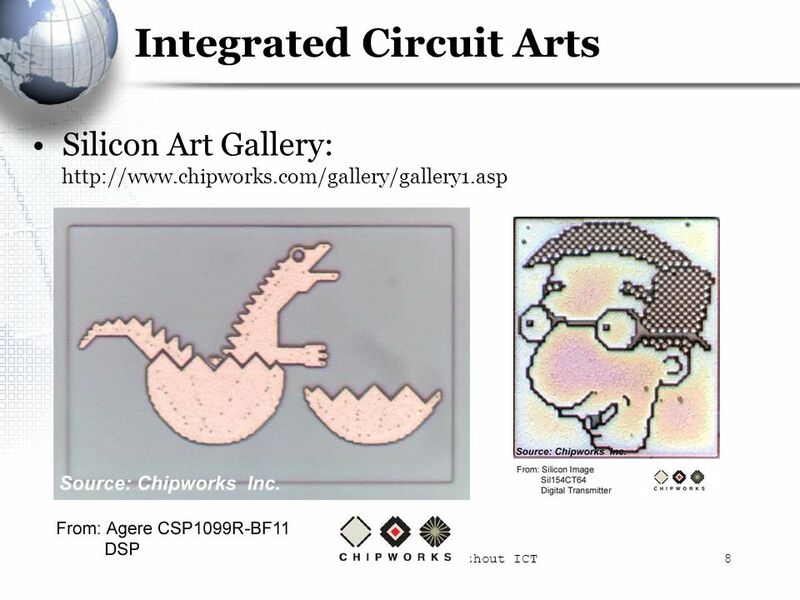 History of Integrated Circuits  In 1961 the first commercially available integrated circuits came from the Fairchild Semiconductor Corporation.  The.